Oracle In-Memory vs SAP HANA, What is your choice? This is one of the very important discussions between DBA’s and BASIS Admins. Let’s see what benchmark results say….! Building on decades of innovation, Oracle Database offers a proven platform with integrated high availability and data protection to deliver a reliable, secure, "always-on" business operation you can count on. Does SAP HANA offer the same high availability capabilities? Read more. Oracle has been an active leader in publishing benchmarks on transaction processing performance as measured by SAP's own standard application benchmarks (SAP Standard Application Benchmarks). Oracle Database In-Memory now enables real-time analytics on live transactional data. With Oracle, performance optimizations are built in for both transactions and analytics, unlike HANA, which optimizes your database for analytics at the cost of slowing down transactions. Where is the benchmark demonstrating HANA transaction processing performance running the SAP standard application benchmarks on HANA? No new APIs and minimal new DBA commands are required, making Oracle Database In-Memory trivial to implement and maintain. Because HANA is a new “platform” with unique operational procedures and programming practices, a new team or retraining is required. Now it’s your time to read the benchmarks white paper and understands the facts and take the decision. By looking the error it looks like the driver does not exists or not installed properly. To find out the driver install or not run below command, if you receive an error then its not installed. SAP DBTech JDBC: : internal error: Cannot get remote source objects: [unixODBC][Microsoft][ODBC Driver 11 for SQL Server][SQL Server]Login failed for user 'hanasdauser'. After installing the driver I was able to create Remote Source in HANA under SDA. 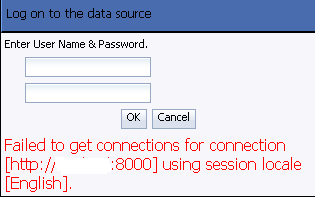 Failed to get connections for connection [http://hostname:8000] using session locale [English]. I was trying to create a OLAP connection from CMC to HANA in BOXI4.1 SP6 for Analysis Office 2.x SSO setup and receive below error. All the server details verified and everything seems to be correct. After doing some investigation I found that the issue is due to limitation in BI platform4.1 sp06 or lower. It cannot able to connect to HANA in CMC because there is no data provider available. JCoDestinationDataProvider setting jco.destination.pool_capacity property to 0 because it was not specified. <exception> com.sap.ip.bi.base.service.connection.impl.ConnectionException: No connection factory found for type session-2:http://hostname:8000:dev:en_US:HTTP:CREDENTIALS:null/HTTP. Possible Solution: Upgrade to BI 4.1 SP07 or higher then you should be able to connect using HTTP provider.